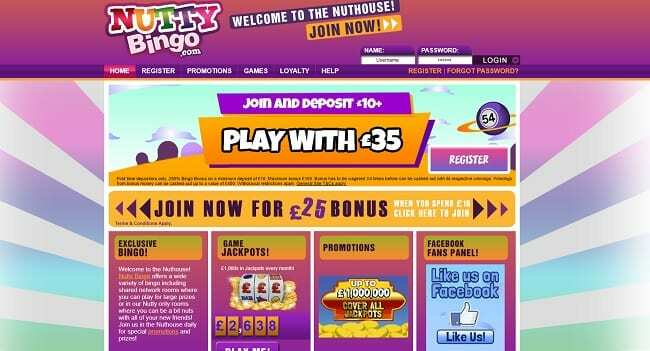 The Nutty Bingo website is a very exciting bingo hall game with lots of personality. It is a great type of Dragonfish bingo site and once on the first page, you can see that there are many wild characters. DEPOSIT £10 PLAY WITH £35New Customer Offer. T&Cs Apply. 18+. Please Gamble Responsibly. At Nutty Bingo you can get a great sign up bonus and enjoy some top games and features. On the homepage, you can see a variety of different promotions. New members are welcomed with a £25 sign up offer with the first deposit. Continue reading our Nutty Bingo review to learn more about this website and its features. There is a very wide fan base as well, seeing as many of the past winners have won prizes valued over 9000 euros, it isn’t difficult to see why. There are thousands in jackpots every month, making it one of the most motivating bingo halls. Also, check out our Robin Hood Bingo review to see another brand from the same network. The website seems very organized, as it has schedules of the bingo games for the month. This website works very well on your tablet and mobile device. With many games to play, you can take it on the go and never have to be bored again. There featured games section is very intriguing, it offers a multitude of different games that you may not have heard of. This makes it very interesting for users, as you won’t be stuck playing games you already know. Some of these games include Gonzo’s Quest, Unicorn Legend, and Elements. These are only a few of the games they have to offer. Let your bingo frenzies run wild in the bingo section of this website. They have games ranging from 90, 75, and High 5 Bingo. These are only a few of the games they have to offer in the bingo section. When you sign up you’ll be able to get a Nutty Bingo bonus of £25 when you make your first deposit of £10. This means you’ll get a total of £35 to play with overall. They even offer a free gift as part of the deal too so you’ll feel really welcome here. There are also several regular promotions available as daily or weekly deals to make sure to look out for these and use them to make your money go further. Check out other sites like Blighty Bingo and Crocodile Bingo to see similar offers and games to play online. Don’t let its goofy, laid-back appearance fool you. Nutty Bingo pays out high amounts to its winners, and for that has kept many happy customers. If you found our review helpful, make sure to sign up today and get yourself a login to the website. You can also try out their latest welcome bonus and other promotions too.